Featuring an outdoor pool and a fitness center, Le Seasons Beach Resort features rooms with flat-screen TVs, located 270 yards from Candolim Beach. It offers Wi-Fi access and free parking. 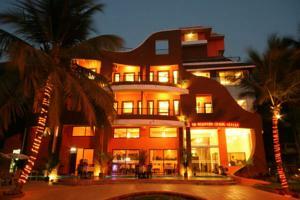 Le Seasons Resort is 28 miles from Dabolim Airport and 9 miles from Tivim Train Station. It is 5 miles from Mapusa and 5 miles from Panjim. Featuring pool views from the private balcony, spacious rooms are equipped with wooden furnishings and satellite TV. Rooms at Resort Le Seasons are equipped with ironing facilities and a safe. A minibar and tea/coffee making amenities are also provided. Guests can lounge by the outdoor pool or get a good workout at the fitness center. Travel arrangements can be made at Le Seasons’ tour desk. The hotel also has a business center and a 24-hour front desk. Le Seasons Beach Resort has a multi-cuisine restaurant that offers both vegetarian and non-vegetarian fare. A wide range of Indian, European and Chinese dishes is available. Le Seasons’ bar offers refreshing cocktails and beverages. Wi-Fi is available in the entire hotel and costs INR 91 per hour. Free! All children under 5 years stay free of charge when using existing beds. One older child or adult is charged INR 1428 per night and person in an extra bed. Maximum capacity of extra beds in a room is 1. There is baby beds in a room is 0 capacity for cots in the room. Any type of extra bed or crib is upon request and needs to be confirmed by the hotel. Supplements will not be calculated automatically in the total costs and have to be paid separately in the hotel. Visa, Maestro The hotel reserves the right to pre-authorize credit cards prior to arrival.